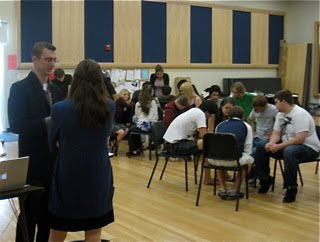 At the end of the two hour session, Ben held auditions for our new honor choir program which will start in September. Ben was thrilled to have nine singers trying out. Called the Louis A. Botto (LAB) Choir, the ensemble will draw from all Bay Area High schools which participate in our programs. There will be three 10-week sessions during the year, with rehearsals every Saturday and some community performances on weekdays. The LAB Choir was inaugurated during our recent National Youth Choral Festival and was, in that case, the 'guinea pig' for LAB Choir Advisor Vance George's sessions with the choir directors. 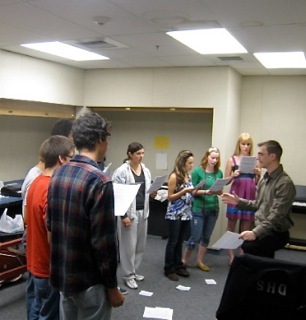 LAB Choir II will make its debut at our Bay Area Youth Choral Festival in October.